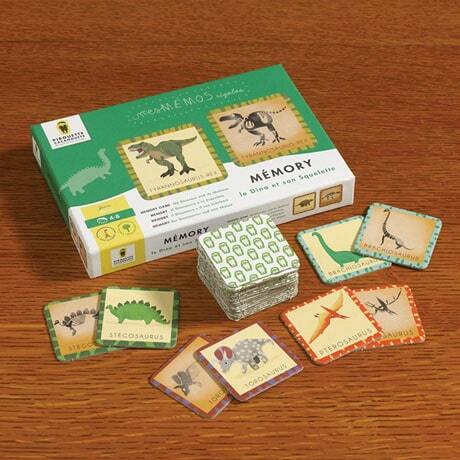 This Jurassic adventure of a game lets little tykes play archaeologists as they hunt for matching dinosaur cards. One of each pair features an adorably illustrated—yet somehow realistically detailed—dino, while its "identical" mate is the same regal beast as a skeleton! Each of the forty 2"x2" sturdy cardboard cards features the dinosaur's name and a distinctively patterned border for extra-clear verification of each coordinating duo. Imported from France, this clever game includes instructions in five languages (including English). For two to four players, ages 4 to 8 (and up up up! ).